I had the help of the Evilpixie, who was wonderful and didn't seem to mind when I said that I thought we'd done it all wrong and we should pretty much start again. There wasn't even much swearing. Here we are at the halfway stage, just getting to the discovery that it was all arse-about-face. And we did have these two odd bits of metal that we weren't too sure about - what were they and where did they go? A quick email to the previous owner of the loom shed some light and we got it all sorted eventually. So here it is in all its slightly tired and shabby glory. It should fit in well around here. I've still got to tie up the treadles. I had to cut the treadle tie-up cords or it would just have been too complicated getting the whole lamm/ heddle/ treadle assembly onto the frame of the loom. I shall get some new cord, some plastic connectors and a new batch of texsolv heddles to supplement the ones on the heddles already. Then it will be ready to go. 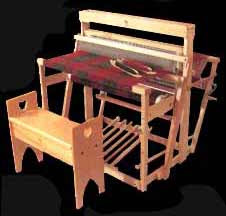 I am delighted with my new loom and hoping to have lots of interesting weaving journeys with it. And I now have a really, really good understanding of how it works which is very handy. Thanks to the Evilpixie for her glamorous assistance, to Bubba for keeping (mostly) out of the way, and to the previous owner for listing it on eBay, taking it to bits and sending it to me when I'm sure she'd rather I'd just pitched up with a van and carted it off.